Providing experienced family law with a focus on retaining your utmost privacy through maximizing dispute resolution in our offices and minimizing litigation in the courtroom. Legal changes to your family are emotional and personal. Our firm is experienced in the representation you need for minimal exposure and maximum compassion. When you have a legal concern of any kind involving your family, your health or your livelihood, it is in your best interests to have it resolved as efficiently and effectively as possible. The sooner these matters are handled, the sooner you can alleviate stress and move forward with your life. When choosing a lawyer to assist you with a family law need, you want someone who is not only experienced, but dedicated to providing the quality legal counsel and personalized service you deserve. At Silvestri Family Law, PLLC we are committed to achieving our client’s goals. Let us put our experience to work for you. We make every effort to resolve disputes using non-adversarial methods, including collaborative divorce and mediation. 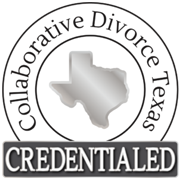 Collaborative divorce is a non-adversarial dispute resolution process in which the parties work together, with the assistance of their attorneys and other neutral professionals, to resolve their disputes without going to court. The process does not put them against each other as adversaries. Instead, the parties, their lawyers, and other neutral professionals work together as a team. Mediation is a useful tool in virtually all family law matters. In mediation, the parties work with a neutral mediator who acts as a communications facilitator and negotiator. Typically, the parties occupy separate rooms and the mediator negotiates individually with each party, attempting to achieve a mutually acceptable and beneficial resolution to the parties’ disputes. Collaborative Divorce: What if My Spouse is Crazy?